Monday, June 8, was the first day of work. The Eucharist, began at 6:15 a.m., with Father Jon Robbins as the preacher and I celebrated. The biblical readings for the week are focusing on the marks of mission, recognizing that “the Mission of the Church is the Mission of Christ.” The readings for the day concentrated on “proclaiming the Good News of the Kingdom.” Father Jon got us off to a right start when he spoke to us about the way in which we exercise our missionary work, by allowing time to experience being in the presence of God. 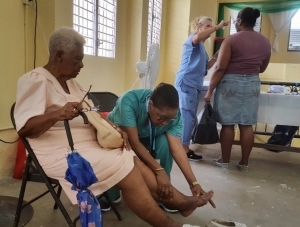 Dr. Arlene Richards, attending a patient at the Adult Health Clinic. Dr. Patricia Rowe-King examining a child at the Pediatric Health Clinic. She is assisted by Missionary, Olivia Blakeman. went to St. Mary’s Anglican School and Parish Hall to set up the clinics for their day’s work. 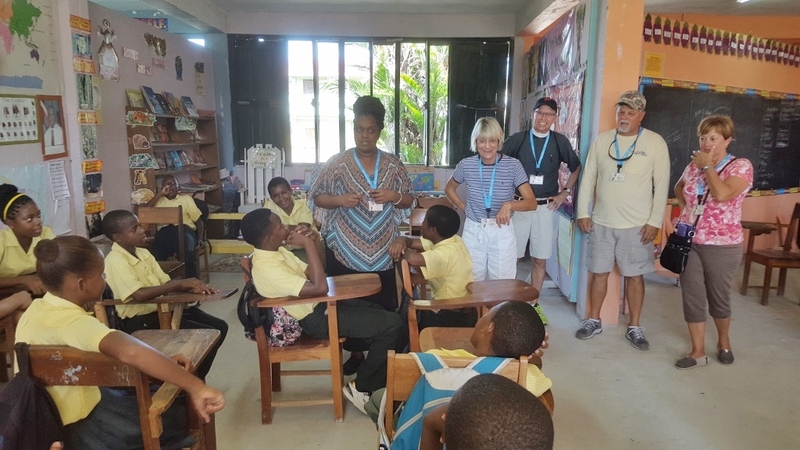 The Vacation Bible School was held at St. John’s Anglican School, and the construction team went to the Anglican School at Queen’s Square to begin painting one of the school buildings and the refurbishing of two restrooms. Once the set-up in the various places was established the reason for being in Belize – to exercise God’s mission – began. During the time I spent with the Health teams, I met with the Principal of the School, Ms. Beatrice Geban. The Adult and Pediatric Health teams, led by Dr. Arlene Richards and Dr. Patricia Rowe-King, took care of 53 persons and 76 children respectively. It was a relatively smooth sailing day for them. In the afternoon, Drs. 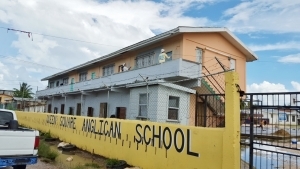 Rowe-King and Richards, and I were interviewed by the television station, Love FM on site at St. Mary’s Anglican School. 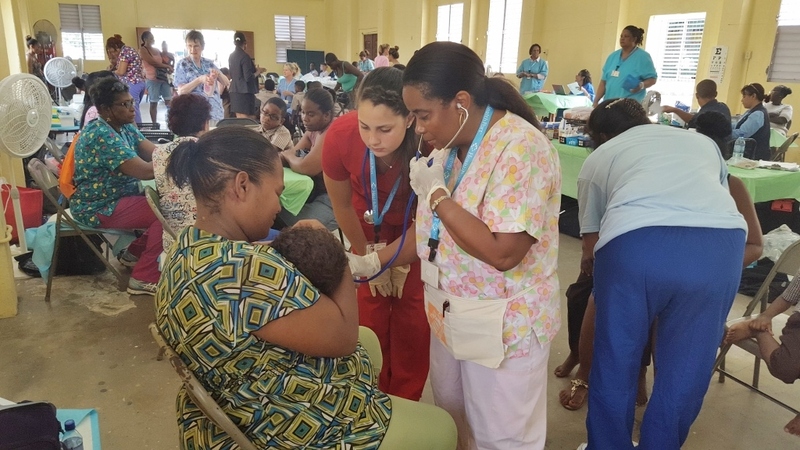 We spoke about the missionary work we were doing in Belize, and the media cameraman videotaped what was happening at the Health Clinics. The interview was shown in the 6 0’clock evening news. V.B.S. Leader, Dr. Dion Scotland, leading a Vacation Bible School class. Other missionaries are looking on. Wright as the focus for the Diocese this year. The Construction team painting one of the buildings at the Anglican School at Queen’s Square. In 2014, the construction group fully renovated a restroom facility with toilets, urinals, and a sink. They painted the outside of the building and erected a new roof. This year, the guys on the construction team are working in two areas of the Anglican School at Queen’s Square. 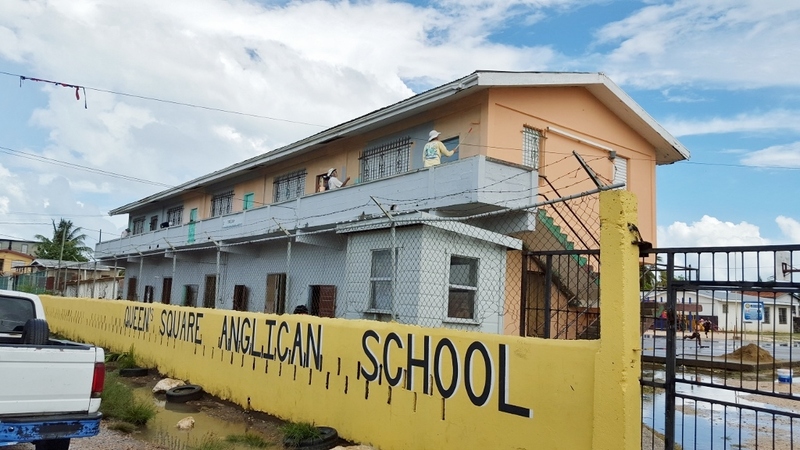 Led by Al Skeete and Bob Webster, the construction team is working in another restroom facility of the school repairing tiles, and erecting toilets, urinals and sinks. They have also installed new windows to prevent the leakage of water into the restrooms which was caused by broken windows. The other half of the construction team is painting the first school building one sees on entering the campus. In the evening, we had dinner in the hotel restaurant, held our team meeting, followed by Compline. 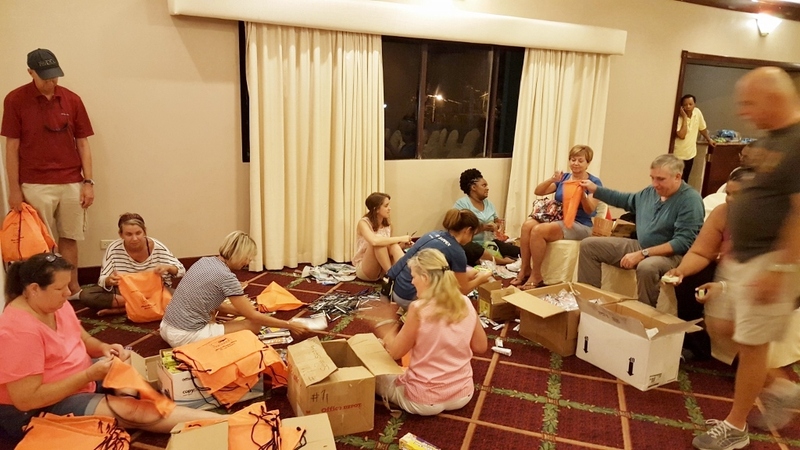 Afterwards, the team engaged in packing bags with gifts for the children in Vacation Bible School and for the children and adults who attended the Health Clinics. 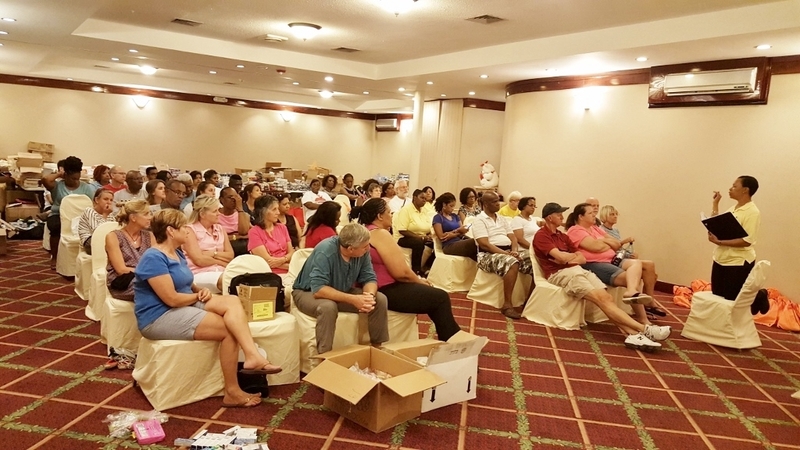 Team Meeting, led by Mission Team Leader, Erna Cunningham. Packing bags with school supplies for children. 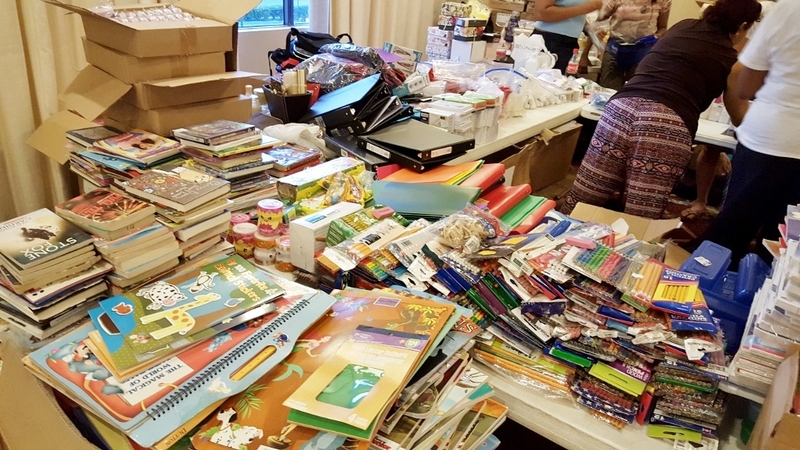 Lots of gifts for children – So much generosity!